The next original DC Universe animated movie has been announced as Justice League vs. Teen Titans, which “welcomes the Teen Titans to the ever-expanding canon of classic DC Comics characters”. 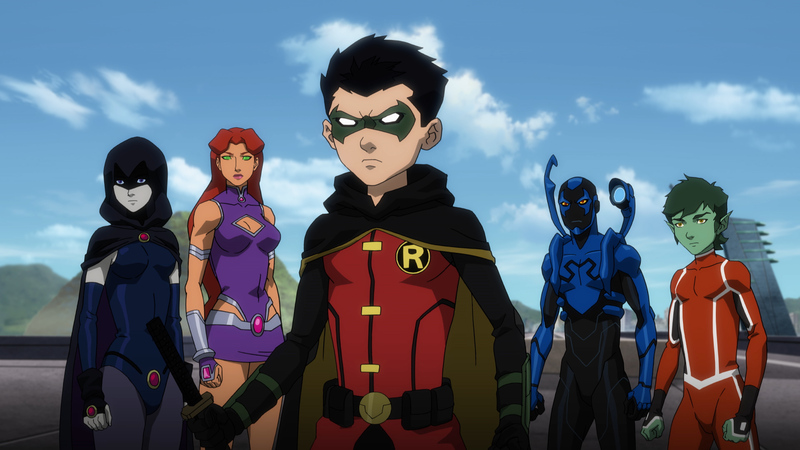 When Damian’s over-aggressive tendencies almost destroy a Justice League mission, he is sent to learn teamwork by training alongside the Teen Titans. However, adjusting Damian’s attitude turns out to be the least of the Teen Titans’ troubles as Raven’s satanic, world-conquering father Trigon begins an escape from his inter-dimensional prison. To complete his return, Trigon must have Raven’s assistance — and to accomplish his goal, he spreads his demonic forces across the globe, infiltrating the minds and bodies of the Justice League to do his bidding. To save the universe and prevent a literal hell on Earth, the Teen Titans must rescue — or defeat — the Justice League, and intern Trigon for all eternity. New to the characters are Taissa Farmiga as Raven, Jake T. Austin as Blue Beetle, Brandon Soo Hoo as Beast Boy, and Kari Wahlgren as Starfire. Jon Bernthal (most recently promoted as the Punisher on the Netflix Daredevil series) plays the villain Trigon.